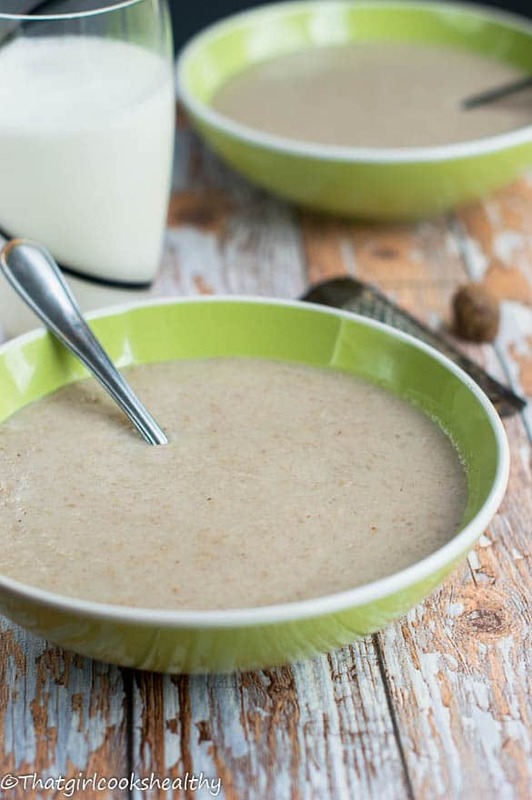 Green banana porridge – a traditional hearty vegan style Jamaican savory porridge made with unripe bananas or even green plantain served for breakfast. 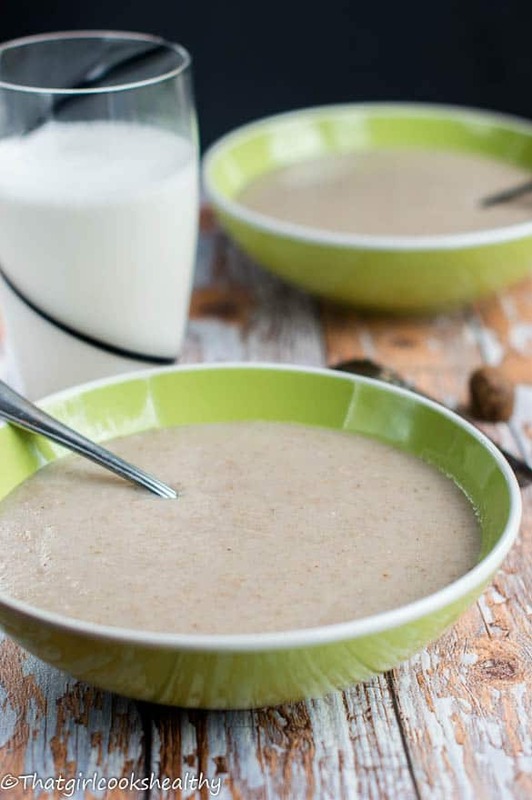 Green banana porridge is a favourite breakfast for many Jamaicans because it is packed with essential minerals and vitamins that not only sustain energy levels but help yield a long lasting fuller feeling. For those of you who aren’t in the loop regarding green bananas do not fret as I am more than willing to share what knowledge of have about green bananas and hopefully convince you to give this recipe a try. 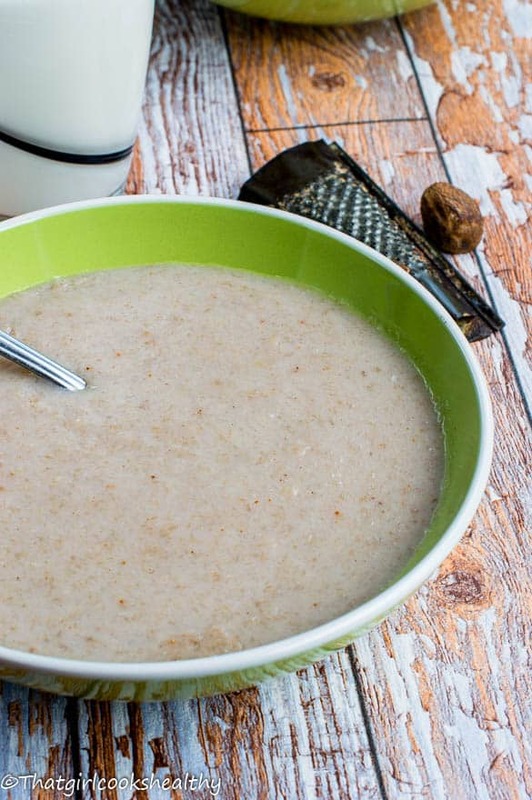 What is green banana porridge? In short green banana porridge is a delicious breakfast made from unripened bananas, water, coconut milk, spices, vanilla and condensed milk . 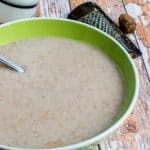 Some people make this porridge with green plantain as well. It’s really a matter of preference and availability. Can green bananas be eaten raw? 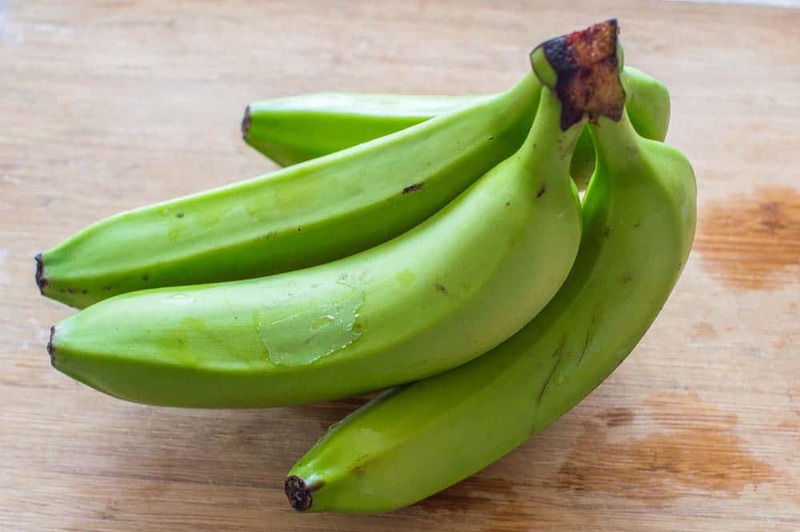 Unlike the ripened crop, green bananas aren’t eaten in their raw form, instead we boil or fry them then adding them to stews, eat alone or make porridge. It all depends on one’s cultural custom. Does green banana a good source of iron? There was a myth that I often heard while growing up among the Caribbean community, that green bananas are a good source of iron. The truth be told they contain a very small amount of iron. Spinach, callaloo or kale would be a much viable source of iron if you’re on a mission to replenish your red blood cells. This wonderful crop contains properties like such as potassium which is crucial for the functioning of the kidneys, helping to keep a healthy balance of sodium in the body while expelling excess water. Green banana contains resistance starch. Resistance starch is an indigestible fibre which slowly sweept through the entire digestive tract evoking a fuller feeling whilst relieving constipation. The aforementioned properties are said to aid lower cholesterol levels, weightloss, and balance blood sugar levels. Keep in mind this recipe is totally vegan, I used coconut milk – full fat or homemade that’s emulsified to get that creaminess and condensed coconut milk to replicate the Caribbean people’s love for conventional condensed milk. Also, you can make this recipe with a green plantain if you wish. I totally forgot to mention that there are actually two version of green banana porridge. The smooth pureed texture has actually evolved from the coarse texture since there were no blenders to puree the bananas in my grandmothers youth. The old fashioned way calls of the green banana to be grated rather than pureed into a smooth consistency. To make the porridge this way, instead of pureeing the bananas with the water you would heat up the water on the stove. While it boils, grate the bananas then stir them into the pot of water, followed by the remaining ingredients. 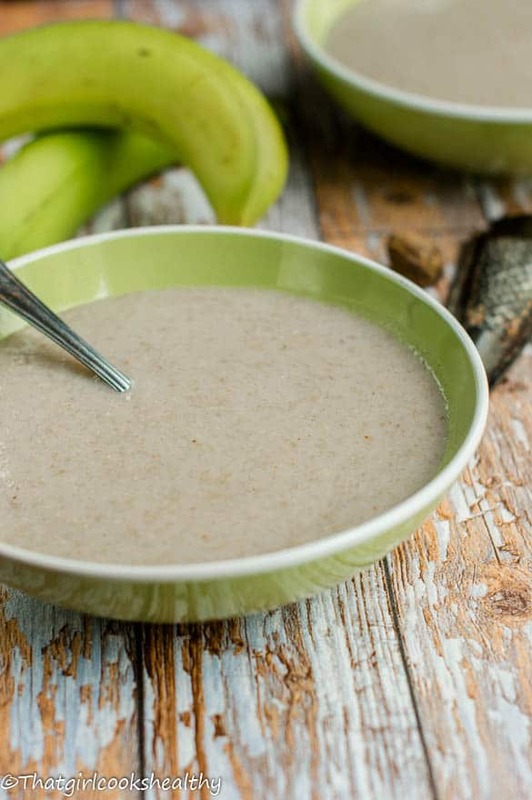 Is green plantain porridge the same as green banana porridge? Yes, some people prefer to make this savoury dish with green plantain instead. The results are the same only using a different type of vegetable. Wash the green bananas to remove any debris. Cut the tips of each banana and make an incision length ways with a pairing knife. Follow the incision around the banana in a circle so that the peel is removed and discard. Slice the banana into large discs and put in the blender with the water and puree. Once pureed pour the liquidised formula into a large sauce and begin to boil then reduce heat while stirring. Then stir in the coconut milk with the spices, pink salt and vanilla. Finally pour the desired amount of condensed coconut milk and allow to boil reduce to a simmer and stir to avoid any lumps for a further 5 minutes. I’ve shared this with a friend who can’t tolerate ripe bananas because of the sugar content, but can handle the green ones. She’ll love it. Thanks! Charlene green bananas is one of the first solid foods we are fed growing up in Trinidad. Mashed green bananas! This porridge sounds so rich and delicious. I haven’t had green bananas is ages! I love green bananas too, I think the entire Caribbean loves them lol. Than k s for sharing this recipe. I was introduced to green banana porridge by a Jamaican a couple years ago and I love it. We in Barbados normally just boil them. This sounds delish. What do you mean by condensed coconut milk? Is that the can 1 that is used in Thai cooking? Aww thank you! Glad you liked it. Growing up in JA, I ate cornmeal and hominy porridge regularly, but never had green banana porridge. sharing, I’ll be making it quite often for breakfast at the weekend. Hi Ceil. Glad you liked the green banana porridge. Not all Jamaicans are familiar with this recipe and I think it has to do whereabouts the individual was raised (i.e town or country). You can always use green plantains to make the recipe if you wish, same results! Great point…I was raised in Kingston, perhaps that’s why this recipe was unfamiliar to me. I have seen a recipe in a never full diet book that says add some walnuts and slice some green banana to porridge but I don’t know if this can be done straight from peel without boiling or blending? Hi. That’s interesting, I would suggest boiling and blending first and then following those steps you’ve mentioned. Thank you for the recipe! In PR we boil them and eat with salad and reconstituted salted codfish. I will try your porridge! Thanks Nic. I would love to try more PR recipes!! Enjoy the porridge, it’s my favourite! Thank you for sharing this recipe. I used to make cornmeal porridge but now have to watch my blood glucose so I’m looking into resistant carbs. My mom was a “country girl” from Annotto Bay so she made this all the time. I haven’t had it since her passing and came upon your recipe. My mom used to grater the banana but that is really labour intense so I will try it your way in the processor and vegan style this morning. My mom also made boiled green banana and other ground provisions with Ackee and Saltfish if we were having it for dinner. Of course she made fried dumpling if we had the saltfish for breakfast. I’m going to try your smoothie next. Hi Jennifer. Thanks for reaching out to me. My website is all about healthy Caribbean cooking as I know high blood pressure, diabetes, kidney disease, obesity are all commonplace amongst the black community. You will find many of my recipes taking blood sugar levels into consideration I often use ingredients have a low GI index which stabilises glucose, reducing that blood sugar spike. Before I started blogging I actually use to do the grating method which I agree is more laborious, hopefully you will find this blender technique sooo much more easier. Hi Tish. I’m so glad I was an inspiration. I would love to know how you remixed the recipe? I bet it was tasty!! Always goes down lovely; at times I also add 1/4 -`1/2 cup oats. Thank you! I will definitely add some oats to mine next time.